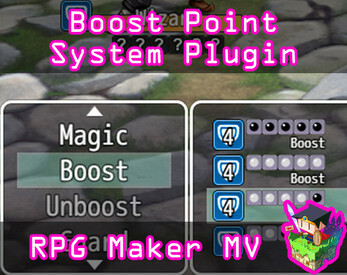 This is a RPG Maker MV plugin that adds a Boost Point System to your game. 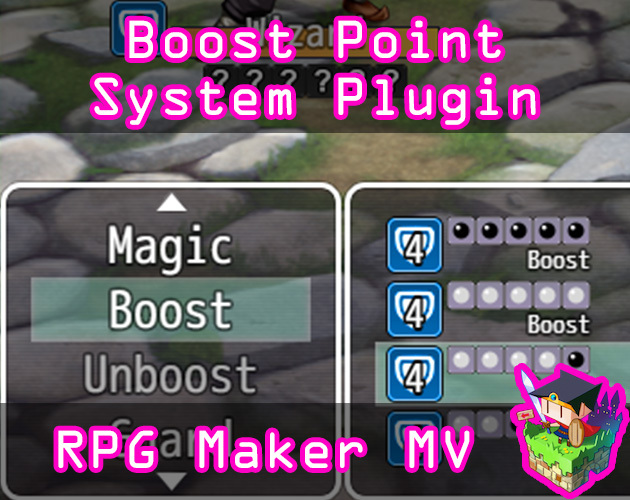 This is a newly added mechanic that allows actors and enemies to temporarily power themselves up for the current turn by using a new resource called Boost Points. Boost Points are acquired at the end of each turn if the battler did not use Boost Points. While Boosted, actions can either deal more damage, hit more times, make buff/debuff effects last longer, and more. The Boost Point System plugin has many ways for you to customize it. Please go through the plugin's parameters to adjust the settings for your game. Show Command? : Show the Boost Command in the Actor Command Window? Show Command? : Show the Unboost Command in the Actor Command Window? Use L and R Buttons? : Use L and R buttons (Q and W keys) to control boosting? Allows you to use Boost in any kind of battle menu without having to use the specialized Boost and Unboost commands. Max Used BP: The most amount of BP a battler can use at once. Damage Multipliers: The multipliers for each BP used from 0 to max. This is the percentage of the multiplier. This affects all skills and items with the <Boost Damage> notetag. For actions you want to deal more damage. Damage Addition: The addition for each BP used from 0 to max. This is the integer version of the bonus. This affects all skills and items with the <Boost Damage> notetag. For actions you want to deal more damage. Repeat Multipliers: The multipliers for each BP used from 0 to max. This is the percentage of the multiplier. This affects all skills and items with the <Boost Repeats> notetag. For actions you want to hit more times. Repeat Addition: The addition for each BP used from 0 to max. This is the integer version of the bonus. This affects all skills and items with the <Boost Repeats> notetag. For actions you want to deal more damage. Turn Multipliers: The multipliers for each BP used from 0 to max. This is the percentage of the multiplier. This affects all skills and items with the <Boost Turns> notetag. For actions that apply states, buffs, or debuffs. Turn Addition: The addition for each BP used from 0 to max. This is the integer version of the bonus. This affects all skills and items with the <Boost Turns> notetag. For actions you want to deal more damage. Analyze Multipliers: The multipliers for each BP used from 0 to max. This is the percentage of the multiplier. This affects all skills and items with the <Boost Analyze> notetag. For the effects found in Weakness Display plugin. Analyze Addition: The addition for each BP used from 0 to max. This is the integer version of the bonus. This affects all skills and items with the <Boost Analyze> notetag. For actions you want to deal more damage. BP Effect Multipliers: The multipliers for each BP used from 0 to max. This is the percentage of the multiplier. This affects all skills and items with the <Boost BP Effect> notetag. For the actions that alter user or target BP. BP Effect Addition: The addition for each BP used from 0 to max. This is the integer version of the bonus. This affects all skills and items with the <Boost BP> notetag. For actions you want to deal more damage. Show Icons? 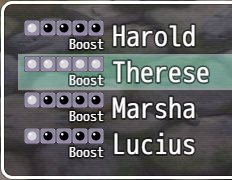 : Show boost point icons in the party status menu in battle? Small Boost Icons: Draw smaller icons? This will make the action require at least x BP to use for actors. If for enemies, then at least x BP must be stored. This will not make the enemies use the BP until you use the enemy BP use notetags. This will make the action require greater than, greater than or equal to, equal to exactly, less than or equal to, or less than x BP for the skill to be used for actors. If for enemies, this will be the BP stored. This will not make the enemies use the BP until you use the enemy BP use notetag. The target will gain or lose BP equal to x. This is a BP effect. The user will gain or lose BP equal to x. This is a BP effect. 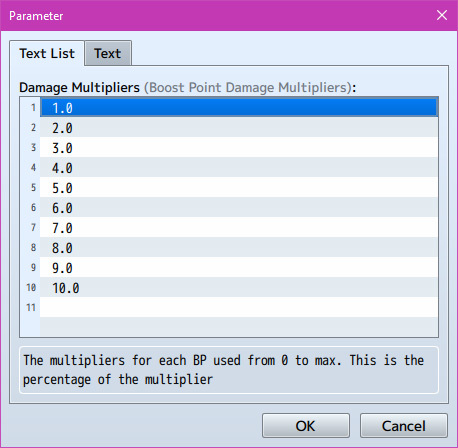 If the action's user is using BP, this will boost the damage multiplier for this action by the multiplier set in the plugin parameters. If the action's user is using BP, this will boost the state/buff turns for this action by the multiplier set in the plugin parameters. If the action's user is using BP, this will boost the number of repeated hits for this action by the multiplier set in the plugin parameters. If the action's user is using BP, this will boost the number of weaknesses revealed for this action by the multiplier set in the plugin parameters. If the action's user is using BP, this will boost the number of BP effects for this action by the multiplier set in the plugin parameters. Whenever the enemy uses skill x (or the skillname if you use that), it will use as much BP as it can for the skill when it performs it. Whenever the enemy uses skill x (or the skillname if you use that), it will use BP after reaching y BP and use as much as it can. Whenever the enemy uses skill x (or the skillname if you use that), it will use as much BP as it can unless BP is over y BP. If a battler is affected by a state with this notetag, they cannot boost. You can put these in a skill or item's help description and it will change the text depending on how much BP the current actor is using. This will apply BP damage multipliers to number x based on the actor's currently used BP amount. This will apply BP turn multipliers to number x based on the actor's currently used BP amount. This will apply BP repeat multipliers to number x based on the actor's currently used BP amount. This will apply BP analyze multipliers to number x based on the actor's currently used BP amount. This will apply BP effect multipliers to number x based on the actor's currently used BP amount. The text inside the brackets won't appear unless at least 1 BP is used. The text inside the brackets will only appear if no BP is being used. The text inside the brackets will only appear if more than x BP is being used. The text inside the brackets will only appear if more than or exactly x BP is being used. The text inside the brackets will only appear if exactly x BP is being used. The text inside the brackets will only appear if less than or exactly x BP is being used. The text inside the brackets will only appear if less than x BP is being used. Sep 4 2018: Added <Boost Sealed> notetag for states. Sep 21 2018: <BP Regen: +x> notetag fixed to work properly! Sep 25 2018: Compatibility added for Item Concoctions.